Did you know you can do one-click webinar opt-ins with Infusionsoft and GoToWebinar? This easy method makes it so your existing contacts can click a link in an email to instantly register for a webinar without having to re-enter their information. You can also use it in a campaign. To create a one-click webinar opt-in, you’ll need to use WebinarCore. This is a free tool that provides a URL you can use with an HTTP Post inside of Infusionsoft. Sign up for a free account. Next, take your GoToWebinar registration URL and paste it into WebinarCore (see screenshot). Enter your webinar title, set the timezone, and click Create. A box will appear with a WebinarSync URL. This is the URL you’ll use inside of Infusionsoft. The last step is to put that WebinarSync URL to work! You can use it in an email broadcast or a campaign. Create a link in your email. Set the URL to your opt-in “thank you” page (either in Infusionsoft or on your own website). For the action, select More… and then select Send an http post to another server. 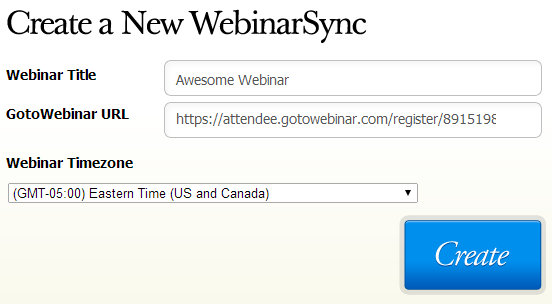 Last, put the WebinarSync URL in the Post URL box and click Save. When your contact gets the email and clicks the link, they’ll be sent to your “thank you” page. Infusionsoft will also send their contact details to WebinarCore, which will then register the contact for your webinar. The contact will get the standard registration confirmation email from GoToWebinar. The Campaign Builder’s email functionality doesn’t let you run an HTTP Post when a link is clicked. Instead, you’ll have to add a tag which will trigger the HTTP Post. First, edit your email and add a link to your opt-in “thank you” page. This is the link your contact will click to opt-in to the webinar. Click the Apply Tags button, and select a tag to identify contacts that need to be registered for the webinar. For example, “Register for Awesome webinar”. Next, create a new Other goal in your campaign. Set the goal to match the tag that you used in the previous step. This will capture any contact that clicks the link in your email. Connect the goal to a new sequence. In the new sequence, add a Process → Send HTTP Post item. Set the POST URL to your WebinarSync URL. Add FirstName, LastName, and Email name/value pairs (see screenshot). Don’t forget to change from Draft to Ready! Back in the sequence, you can also optionally remove the tag, apply new tags, send a custom registration “thank you” email, or anything else you’d like. When your visitor clicks the link, they’ll go through this sequence, get registered for your webinar, and receive a registration confirmation email from GoToWebinar. Your HTTP Post won’t work unless you add FirstName, LastName, and Email! You can also use WebinarCore in other places within Infusionsoft. For example, you could create a webinar registration web form. This would insert your visitor’s information into Infusionsoft, and then do an HTTP Post to WebinarCore to register them for the webinar. This allows you to build your list and sign people up for your webinar at the same time. Have an idea for a tip? Let us know!